A mixture of wild and brown or basmati rice is fine, or you can buy a bag with wild, brown basmati and Camargue red rice all in one, which looks great. Put the rice into a saucepan and cover with the stock. Bring to the boil, season, then reduce the heat to a simmer. Cook until all the stock has been absorbed and the rice is tender. If it gets too dry, add a little water. It will take 25–30 minutes. 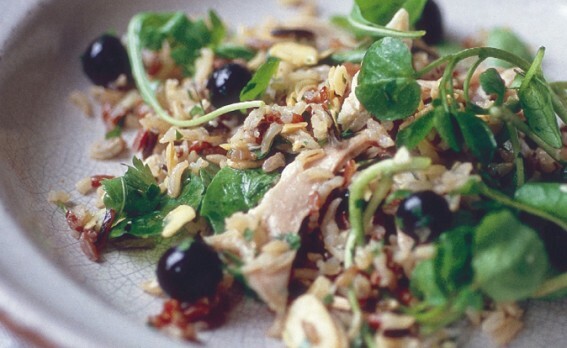 Remember, wild rice never goes soft; it remains firm and nutty. Meanwhile, make the dressing by simply whisking everything together. Taste for seasoning. As soon as the rice is ready, pour on half the dressing and mix well so it absorbs the dressing while still warm. Leave to come to room temperature. Toss in everything else, together with the rice and the remaining dressing. Taste for seasoning; rice dishes need a lot. This is also good the next day, but let it come up to room temperature once you’ve taken it out of the refrigerator. You can make a version of this salad with dried apricots and pistachios (it’s very pretty) or dried cranberries and chopped pecans instead of fresh blueberries.